Its a real chore having to fork out for a new uniform every year. The fact that its utterly useless apart from an initial week of mirror posing and (home) matchdays is an added reason to resent being shafted for £60 every year. Grrrr. But hold on a second, those soccer-socialistas at fortress Boleyn have decided to supplement 'affordable' footie at the new stadium with 'versatile' club apparel!!! The jersey is specially designed for use during non-fan duties and, if you have a pointless job in the civil service, it could even be worn in to work! It will undoubtedly get a bit hot for Nobes and the lads - especially in the July Europa Carnival, but when November bites with trips to Newcastle and other Nordic regions, both fans and players will be singing the praises of the new woolly kit. 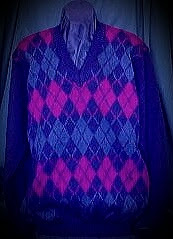 And it has all harlequin bits, like a lopsided claret n blue Croatia kit! Not funny - ok, at least we've got you to raise a chortle or two! 4 minutes - are you a slow reader? Why does everybody focus on the new home kit when the away strip is usually where all the creative action is at? Surely we have got to bring back the sky blue with double claret hoops across the chest this year? Will there be a special kit for the Europa League? In fact, no. Definitely not. The problem is a tremor!